Google Maps camera car spotted! Something you really don’t expect to see from a car — soap bubbles! Image courtesy of Pfefferle, Morguefile. To be sure, I have seen some odd vehicular sights in my time. One of my Valley friends has a vehicle with a painted hood. A former co-worker of mine did it for him — it’s a forest and lake scene with someone paddling a canoe through the water. It’s the only piece of “drive-able” art I know in the entire Shenandoah Valley. Another day, I was driving home one afternoon along a two-lane road. This particular road crosses a stream that has a narrow bridge for vehicles; we have to stop and take turns, letting the vehicle on the other side use the bridge before we attempt to cross it. Suddenly, the other drivers and I were much diverted to see a bunch of soap bubbles dancing through the air. (I kid you not.) 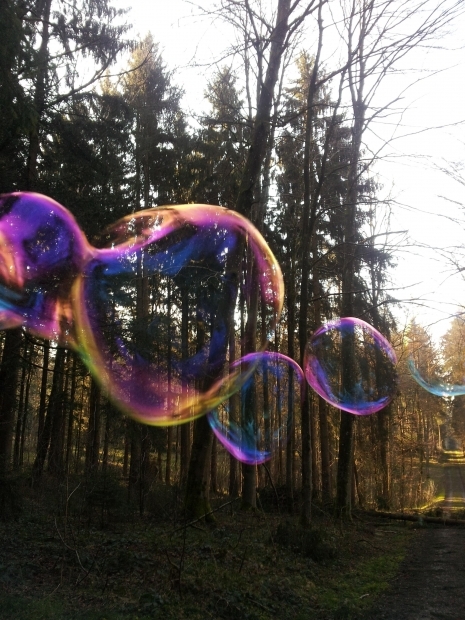 There weren’t any kids or adults on foot blowing soap bubbles, so I wondered what created them. I put down my window, stuck my head out and looked around; it turned out that the soap bubbles were coming out of a spout in a car going past me. How the heck they rigged that vehicle for soap bubbles, I don’t know. Bear in mind that both of us are traveling at a speed of about 55 miles per hour. I watched it come toward me; it was a white vehicle with a green door. How amazing is that??!! It was pure chance that I saw it, since I had no idea it was in the area. I’m thinking of putting it on my list of Amazing Things I Never Imagined I’d Ever See. Viewing the inside of Buckingham Palace and getting the chance to see Train and Pentatonix sing are also on the list. I’m still amazed.